Opposition leader Mallikarjun Kharge submitted a note of dissent but Justice Sikri, the third member, backed the government view. Verma has been appointed DG, Fire Services, Civil Defence and Home Guards. 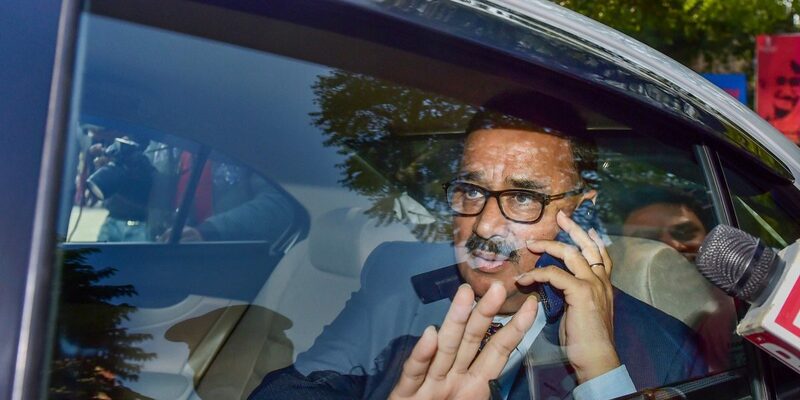 New Delhi: Barely two days after the Supreme Court held his ouster to be illegal and restored him to his position, Central Bureau of Investigation director Alok Verma was sacked by a high-powered committee on Thursday night. The 2:1 decision was made after a more than two-hour long meeting of the panel, which comprises Prime Minister Narendra Modi, the leader of the largest opposition party – Congress leader Mallikarjun Kharge – and Justice A.K. Sikri. Sikri was standing in for Chief Justice of India Ranjan Gogoi, who recused himself from the process as he had written the order backing Verma on January 8. Kharge opposed the move to sack Verma and submitted a six page dissent note, but Justice Sikri and the prime minister found his continuance detrimental to the institutional integrity of the CBI, presumably on the basis of the Central Vigilance Commissioner’s ‘sealed’ report to the Supreme Court. No details of the reasoning behind the committee’s conclusion have as yet been made public. In his dissent note, Kharge protested the fact that the committee neither gave Verma a hearing nor bothered to consider his replies to the CVC’s report. In addition, he made four substantive points: (1) Alok Verma should be restored to his position with full authority, including the ability to take so-called policy decisions; (2) that he not be penalised for the time he was not allowed to attend office on the basis of orders the Supreme Court found illegal, and be given an extension of 77 days; (3) that the CVC’s report, even on a plain reading and without giving Verma the right of reply, did not contain any substantial findings against the CBI director as to warrant his removal; and (4) that an investigation be ordered into the ‘conspiracy’ involved in Verma’s midnight ouster last October. In a table included as part of his dissent note, Kharge listed out the specific allegations the CVC probed and its findings. Six of these allegations, according to the CVC’s report, were found to have been not subtantiated. Only in four of the allegations did the CVC record findings “unflattering” to Verma, said Kharge, adding that even here the conclusions were on the basis of “circumstantial evidence” and that there was no proof of any pecuniary benefit. Verma’s removal from the high-profile post – ostensibly on charges of corruption and dereliction of duty – make him the first chief in the history of the agency to face such action, officials said. Appointed to the position on January 19, 2017, his tenure would ordinarily have ended on January 31, 2019. The government announced shortly after the meeting that it had reassigned Verma to the post of DG, Fire Services, Civil Defence and Home Guards. Late on Thursday night, Verma said that he was transferred on the basis of “false, unsubstantiated and frivolous allegations” made by only one person. Verma said in a statement to PTI that the CBI, as the prime investigating agency dealing in corruption in high public places, is an institution whose independence should be preserved and protected. “It must function without external influences. I have tried to uphold the integrity of the institution while attempts were being made to destroy it. The same can be seen from the orders of the central government and the CVC dated October 23, 2018, which were without jurisdiction and were set aside,” he said. 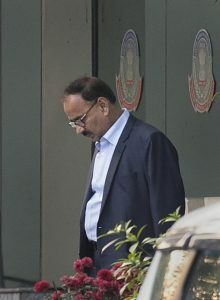 M. Nageswar Rao, whom the government had appointed acting director of the CBI when it ousted Verma last October, has once again been given temporary charge of the agency. 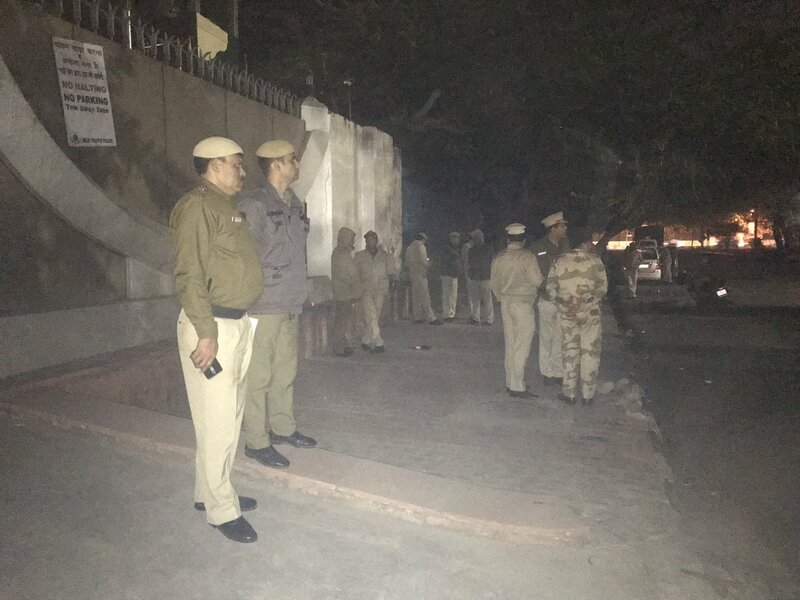 To supervise the transition, a full police bandobast was evident outside the CBI’s headquarters in the CGO complex on Thursday night. The orders issued by Verma following his re-instatement are now likely to be reversed. On Wednesday, a day after the Supreme Court’s order, Verma had rejoined office and among the first orders he had issued were the rescinding of transfer orders issued by the interim director M. Nageswara Rao. A new CBI chief will appointed over the next four-five days. In the meanwhile, Rao took charge on Thursday night itself. 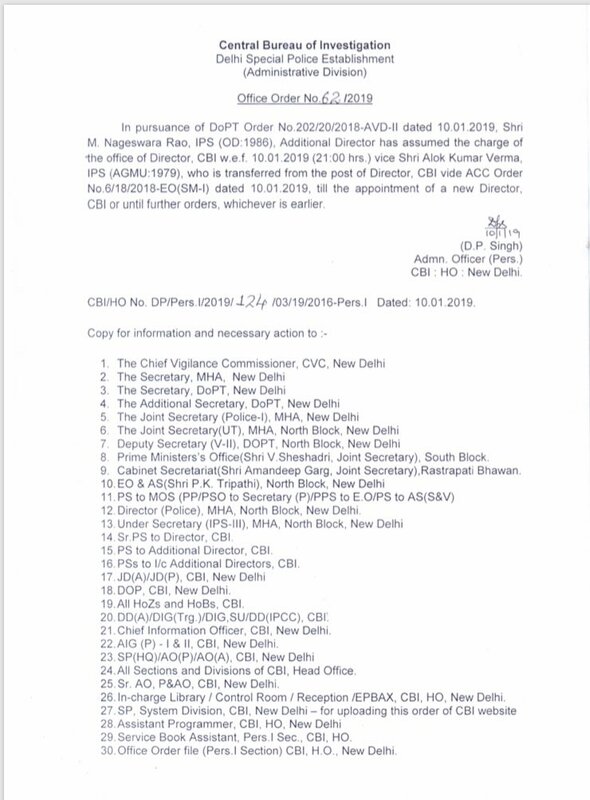 CBI memo of January 10, 2019, noting that Nageswar Rao has taken charge of the bureau. Verma was sent on forced leave by the government in a late-night controversial order on October 23, 2018, in the wake of a feud between him and his deputy Special Director Rakesh Asthana.